VATICAN CITY (CNS) — “They call me Holy Father and that is what I must be,” the future St. John XXIII wrote in his diary. Most Catholics would agree the church needs holy and saintly popes, but as the April 27 Mass for the canonization of Blesseds John and John Paul approached, some questioned the need to canonize them. Another criticism revolves around the quick pace of the sainthood process for popes, especially for Blessed John Paul. Questions have been raised about how it is possible in such a short time to thoroughly investigate a candidate’s life and writings, not to mention the enduring devotion of the faithful. Msgr. 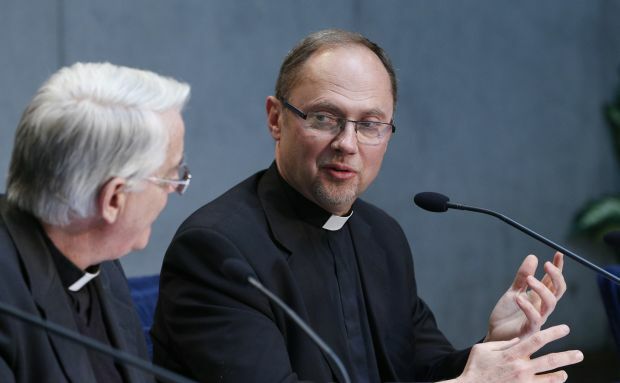 Slawomir Oder, postulator or promoter of Blessed John Paul’s sainthood cause, was asked by media April 22 about reports that the pope had ignored evidence that Father Marcial Maciel Degollado, the late founder of the Legionaries of Christ, had been sexually abusing minor seminarians and leading a double life. In Blessed John Paul’s sainthood cause, he added, the dispensation of the five-year waiting period “was the only exception” made from the normal procedure called for in church law. Blessed John Paul, who beatified and canonized a record number of Catholics, often explained that the church solemnly recognized certain holy men and women so the Catholic faithful would have models to imitate. On a practical level, he urged the Congregation for Saints’ Causes to devote more time and energy to identifying, studying and speeding up the sainthood processes for laypeople, especially married couples, because modern Catholics needed those models. The saints may be models, but they are not angels, and the priests formally promoting the causes of the two popes acknowledged that fact. “It would be absurd to have a pope who evangelizes and doesn’t arrive at holiness himself,” Msgr. Oder said. In addition, St. John Paul will remain “a point of reference for his successors, but not only for them,” he said. Karol Wojtyla, the future pope and saint, pursued holiness as a student, an actor, a quarry worker, a poet, priest and bishop — and many people can find inspiration in his life. The Franciscan works mostly on the causes of other Franciscans, but occasionally promotes other causes as well, including the recently beatified 19th-century Queen Maria Christina of Savoy. “Recently I’ve had the joy of proposing for the veneration of the church both a queen and a pope. Obviously, they led totally different lives, but in fulfilling the call of every baptized Christian, the call to holiness, they are similar,” he said. “Obviously, his papacy was the apex of his holiness, because then he had enormous weight on his shoulders, a great responsibility, and still knew how to pursue God’s will,” the postulator said. Jesuit Father Federico Lombardi, Vatican spokesman, said thinking of new saints only as models to imitate narrows their importance and misses one of the riches of Catholic teaching.